Update emergency contact info in your preparedness manuals and for babysitters: Because most kids are out of school, summer brings more opportunities for having babysitters in your home. You probably already have a list of emergency contact information on your fridge (if not, this one is very handy) but summer is a great time to update relevant phone numbers and addresses, medical information, heights and weights for kids, any changes in doctors or medications, and anything else that might be helpful in an emergency. It’s easy to forget that this information is useless if it is not up-to-date. Be sure to write the home address on the list in the event that a babysitter might need to call for help. CPR Certification: Now is a great to get certified in CPR or to renew your certificate (certificates are typically valid for two years from date of issue). If you’re currently CPR certified, it may be good to take an online refresher course, just in case. See if older children in your household are willing and eligible to receive certification (check age requirements in your area). Even pre-teens can become valuable members of your home safety team. Sunscreen stockpile: Go through your sunscreen and check the expiration dates. Throw out anything that is expired or has cancer-causing chemicals as a main ingredient. Check contents to see if there has been any separation, change in consistency, or if the product has developed an unusual smell. If so, toss and replace. Make sure to inspect the sunscreens you carry around in beach or diaper bags as well. First Aid: While you’re going through your bathroom cabinet to check out sunscreens, now is a great time to make sure your first-aid kit is fully stocked and that you have all necessary components. In summer months, pay particular attention to skin issues that may arise. Make sure there is ample calamine lotion, and aloe vera in the event of a bug bite or rash from chafing or a poisonous plant. Remember that summer means grilling and fireworks and therefore there is more potential for burns. If you aren’t sure what to include in a first aid kit, this is a great one to get you started. Insure that the pool area is safe: Now is a crucial time to make sure that the doors, gates, or pool cover you use to keep children safe around your swimming pool or hot tub is in proper working order. Replace any locks or latches that may be old or defective and be sure that all pool chemicals are also stored properly and safely out of reach of young children. Even if you don’t have children or if yours are expert swimmers, always be aware that visiting family and friends need to be protected as well. Inspect outdoor play areas: If you have any playground or sport equipment (such as a basketball hoop) now is a great time to make sure everything is in working order. Check that all bolts and screws are tightened and make sure that no rust or other safety hazards developed over months of disuse. Check that there are no holes or cracks in the ground where children run. Also check for any insect infestations that may have occurred—my family learned this the hard way after yellow jackets built a nest under our sons’ playground slide! This is a great time to attempt to see your household through the eyes of any guests you might host over the summer. 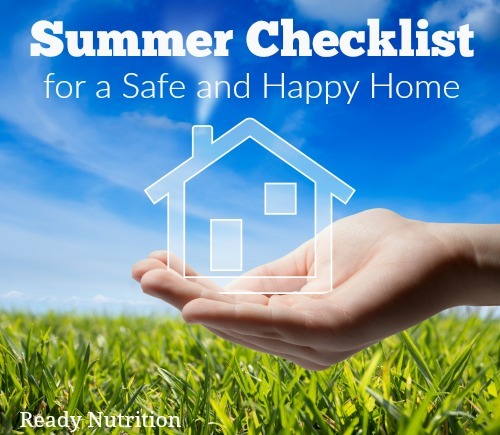 You want this to be a time for fun and relaxation—it only takes a few steps to get greater peace of mind and to ensure that your family and friends are safe and protected in your home.